This running program consist of three main parts, first fat burning this program will for sure burn fat. Second endurance you will have a much better breathing pattern during and after this workout over the next 30 days. Third, the shape of your body will change regardless of whatever it looks like now, after 30 days you will see a noticeable difference. Everyday is a 30 minute workout to be complete 4 - 6 times per week. So you will need a stopwatch or a watch if you miss more than three days per week you will need to go back and repeat that week. But whatever you do do not give up. I just started this tonight. I am preparing to run/walk the 5K Turkey Trot on Thanksgiving morning. I'm quite nervous because I am 320 pounds right now. I'm hoping to just not DIE doing this thing! :) But I'm also hoping this is the beginning of something new and wonderful for my life! Good luck Jenny! You can do it!! That is AWESOME! I'm doing my first 5k in January. I'm 270 pounds! That's awesome!!!! You can do it!!! It is an incredible rush when you finish your 5k! Never ever thought I would be 49 when I did my first one! I'm trying to do one a month. Jogging/walking outside is so much more rewarding for me. Find what you like best and don't let anyone tell you any different. I want to hear how you did!!!! Go girl! Getting ready for my first 5K - The Diva Marathon in North Myrtle Beach on April 27th. How are you doing, Jenny? I did my first 5k last fall. Now I walked the whole thing but I finished and did a better time than I thought I would. It is about getting out there and doing the best YOU can do. Signed up for my 2nd 5k this spring. Do you train inside or outside? Oh girl- you just go! I was looking at this wondering myself...I think I am going to do it too! Good luck and I will keep you as my inspiration! Just started this yesterday and I'm pretty excited to see what kind of results I end up with. I'm on phase 3 of the program. It's really great! i can already feel myself getting stronger. I just started this the other day, but I'm only doing this to help with my track and field season! I'm only 13, 102 lbs. But I'm hoping this will help me in our meets where I run long distance and I'm hoping to do a 5k later in the spring with a friend! Do you have faster results with this than with couch to 5k!? can you do this twice a day??? (Especially my legs). I promise you will see results in 30 days!! Take before/after pictures and record your measurements before/after also!! 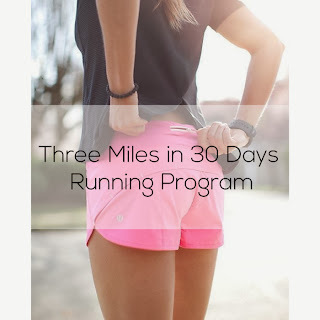 When you ran 30 minutes, did it equal 3 miles? I second this question. I want to continue to improve. Maybe work towards running for an hour! Once you can run thirty minutes straight, it's relatively easy to add time. Just add 5-10 minutes to your run time every week. Monday 32 minutes, Tuesday 34 Minutes, Wednesday 36 minutes, etc. You can do it! SMC...I am curious what weight range or size range you are. I am def not a runner and am def a plus size who works out 3-4 times a week. I started the couch to 5k last year before my first 5k walk/run. My goal then was to just finish and not be last. Well not only did I finish and wasn't last, I did the walk in less time than I anticipated. Already signed up for my next one this spring. My goal this time around is to walk AND run this one. So, I was just curious about you to see the probability for me. Good luck and keep running! I am a little confused on how the program works, I would love to do this but I need to know what I am doing first. For example day 1 through day 4. do I repeat #1-#5 for 30 minutes each day? Or do I do #1 for the first day, #2 for second and so on? It's for 30 minutes each day. So you repeat steps #1-5 each day for 4 days and then you move on to the next set of steps for days 5-9. Good luck! Is there a playlist or podcast that has the intervals with music? About halfway through the program so far...going well. I have enjoyed this much better than C25K and appreciate the sprinting that is incorporated. Thanks for sharing! My dad and my sister are climbing Mt. Kilimanjaro in Africa in September. My sister was telling me about her running training program. She runs up and down steps at the high school football stadium with a fully loaded camping back pack. Unbelievably, she does 3,000 "steps" per week to get ready for Kilimanjaro. I did this and oh my gosh it was amazing. Even though it took me a little bit more than 30 minutes to finish the 3 miles, I could not be more proud of myself. For me, someone who couldn't run a lot before due to knee problems, to become a runner and almost run 3 miles in 30 minutes is beyond incredible. I'm just about to start it so it's great to read your positive comments. I was surfing looking for another 30 day challenge to undertake and found this - perfect for me as I'm reluctant to do it but know I need to! Thanks. Thank you so much for posting this! I am going to do it! I am 240 with diabetes and RA. I am trying to get it under control and this should help. I feel better knowing there are others like me trying this!! Does this program help you to loose weight as well as help you get stronger? I am trying to get myself in shape before summer. I am going to Adriatic sea and wish to look my best. Thanks! Can't wait to try this tomorrow morning! so sorry this may sound like a silly question but what speed is recommended in walk jog and sprint mode or do I just make up my own comfortable speed? I have been a runner for 15 years, with a marathon and several half marathons under my belt. Life got in the way about a year ago, and I stopped running. The couch to 5K was always a frustrating approach because it was too slow to get to miles. This plan is awesome! Treadmills vs. Exercise Bikes: Which is Better?